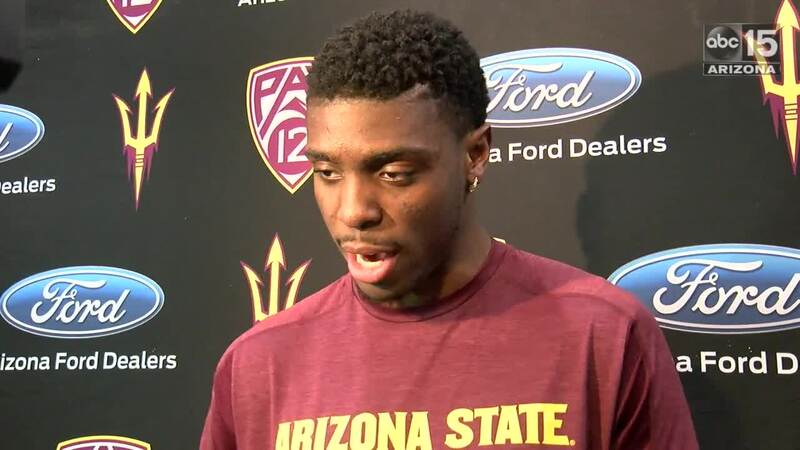 Zylan Cheatham lost his brother to a shooting in December. From 3 to about 3:45 on Sunday afternoon, time moved at a glacial pace for Zylan Cheatham. "The longest hour of my life, hands down," said Cheatham, a former Phoenix South Mountain High School star and a senior on the ASU basketball team. "Every commercial seemed like it was going on for 30, 40 minutes. I’m just like, 'Man, what’s going on?'" But ASU coach Bobby Hurley and his assistants kept assuring Cheatham that the Sun Devils' name would eventually be called during CBS' NCAA Tournament selection show -- and they were correct. The Devils -- along with ASU's first-round opponent, St. John's -- were among the last of the 68 teams called during the telecast, sending a wave of emotions through the 6-foot-8, 220-pound power forward. "I dropped a tear or two," he said. "It was just an unbelievable environment, an unbelievable moment for not only me but for my guys, Bobby, (athletic director) Ray (Anderson) -- everybody who was a part of that, it’s just a great opportunity. "You put in so much work, you sacrifice so much, and for that to be rewarded at the perfect time is unbelievable." To say that Cheatham's senior season has been an emotional rollercoaster would be a massive understatement. After beginning his college career at San Diego State, Cheatham transferred to ASU for his senior year, in part because he had never played in the NCAA Tournament and believed joining the Sun Devils would give him an opportunity to do so. ASU got off to a tremendous start in the 2018-19 season, including a win over then-No. 1 Kansas in Tempe. But one week after that win, and just four days after Christmas, Cheatham received devastating news: His brother Wanyaa Stewart had been shot in Tempe. Stewart was transported to a nearby hospital but did not survive the shooting. Cheatham, however, didn't miss a game for the Sun Devils, as he was determined to honor his brother with his on-court performance. And he said accomplishing his dream of advancing to the NCAA Tournament is something that would have made Wanyaa proud. "Every game, I keep my brother’s obituary with me, and I figuratively talk to him," Cheatham said. "I know he’s looking down on me happy and excited. This is something he’d definitely be excited about right now. "Obviously (making the NCAA Tournament) doesn’t bring him back and it doesn’t make the situation any lighter, but it’s definitely a step in the right direction." As soon as Sunday's announcement was made, Hurley, who watched the selection show with his team at his home, hugged as many of his players as he could. Cheatham was one of the first guys he looked for. "He wanted it so bad," Hurley said. "It was upsetting for me to watch him as we weren’t being called and just seeing how he was reacting, because I know how much winning means to him and getting to this Tournament so he can showcase his abilities in this event." It's safe to say the Devils would not be Tournament-bound without Cheatham, a do-everything forward who became the second player in ASU history to record a triple-double in a win over Texas Southern on Dec. 1. "That guy has got tremendous qualities of a winner and intangible things that he brings to our team," Hurley said. "I’m very excited solely (because) he has this opportunity, just with everything he’s had to go through this year." Cheatham has carried his brother's memory with him everywhere he and the Sun Devils have traveled this calendar year. He'll bring it to Dayton, Ohio on Wednesday, when ASU will face St. John's with a chance to win its first NCAA Tournament game in 10 years. If the Devils win, they'll head to Tulsa, Oklahoma to face Bobby Hurley's former team, the Buffalo Bulls, on Friday. With such a massive opportunity in front of them, Cheatham says the only thing that can stop the Sun Devils is themselves. "I don’t think there is a ceiling for our team," he said. "I think when we’re knocking on all cylinders, when we’re healthy, when we’ve got everybody on the same page as far as doing whatever it takes to win, I think we can really make some noise and compete with anybody."